This compact Nitro Mesh is absolutely ideal for younger drummers or even as a basic practice kit for more established players. Inbuilt songs aren’t the best. 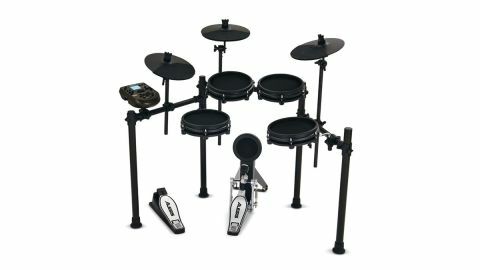 With a recent re-vamping of its e-kit lineup, we have seen Alesis raise its game with the new flagship Strike and Strike Pro kits, in addition to expanding its entry-level range with the smaller Surge and Command Mesh kits. The Nitro Mesh is the most affordable member of the Alesis family, which has now been treated to a few upgrades of its own, whilst managing to preserve its low price point. The compact eight-piece kit is almost identical to the previous Nitro package except for the addition of brand new mesh snare and tom pads. The all-black 8" pads have an extremely shallow profile and feature a plastic rim, enabling adjustable tension of the mesh heads. Also of note are the newly-designed bass drum and hi-hat pedals which, being slightly wider than the original models, allow for a sturdier feel. New brushed steel pedal boards add a classy touch. The budget package is made up of a rubber kick drum pad, dual-zone 8" mesh snare, three single-zone 8" mesh tom pads and three single-zone 10" cymbal pads (one of which has choke functionality for use as a crash). These pads plug into the module via an included 25-pin loom cable and there is also room to expand with a fourth tom pad and cymbal (the tom pad is dual-zone capable, the cymbal is single-zone but chokeable) using additional jack inputs. Other connectivity includes mini-jack headphone out and aux input, plus USB and 5-pin MIDI. The Nitro Mesh’s aluminium frame is considerably smaller than others in the Alesis range and it also features much slimmer tubes. This helps to keep the whole setup extremely lightweight and also results in a smaller footprint. The rack slots together with ease and feels suitably robust considering its small size. The uniform black colour - from the trigger pads to the mesh heads, frame and even cymbal arms - affords the kit a pleasing and sleek overall aesthetic. As the L-rods position horizontally through the bottom of the pads rather than vertically, once the snare and toms are in place there is no noticeable hardware on display. The small curved module plays host to 40 kits, which break down into 24 factory presets and 16 empty slots. There are 385 individual samples onboard including those that can be used to alter existing kits or create brand new user kits. There are also 60 built-in MIDI sequenced playalong tracks which, although a little cheesy, span many genres from rock and funk to Latin and jazz - useful for budding drummers. The module also has a simple layout and sports some basic coaching functionality as part of the inbuilt metronome. Building the kit from scratch takes very little time and we’re delighted with how compact the kit is once the mini four-post rack is erected and pads are placed. This kit is as easily adjusted to suit a small child as it is for accommodating an adult. The supplied cable loom is also a great time saver when it comes to connecting the pads. The kit presets are on the basic side but this is to be expected for an entry-range kit. From a comparative price point, the inbuilt samples are above average. With a wide range of styles and a mixture of acoustic, electronic and percussion-based kits, the Nitro Mesh is ideal for someone starting on their drumming path or as a basic practice kit for players a bit further down the line. With this type of drummer in mind, the dynamic range is more than adequate. Multiple velocity layers allow ghost notes and accents, plus of course rim shots on the snare drum. More simplistic patterns are perfectly gratifying whilst more advanced phrases and intricate ghost note patterns do not translate so well. The dual-zone snare pad offers rimshot and cross-stick capabilities by striking the rim. A gentle tap will play the cross-stick while a more forceful hit will trigger the rimshot sound. Unfortunately, this can be tricky to keep consistent and resulted in unwanted triggering. For this reason, we preferred the kits without any cross-stick sound. It became apparent whilst using the plastic rims that they’re quite noisy in comparison with the more common rubber, however, the mesh heads themselves are actually relatively quiet. The inbuilt songs aren’t of the best quality, but playing along to your own music is easy via the aux input. MIDI capabilities also make it possible to rig up with software like Superior Drummer should you outgrow the inbuilt kit sounds. Experimenting with the extra trigger inputs we were able to set up a second crash and fourth tom, which makes for some enjoyable practice time. We used our own hardware to mount the additional pads as it looks like it would be a tight squeeze to fit them onto the existing rack, particularly the extra floor tom.